For three generations, it has been our privilege to serve all faiths within our communities with dignity, honor and respect, through our funeral home. Our location at 439 Maywood Avenue in Maywood, NJ, is within easy access to not only the families in Maywood, but also those from Hackensack, Rochelle Park, Paramus, River Edge and Saddle Brook. 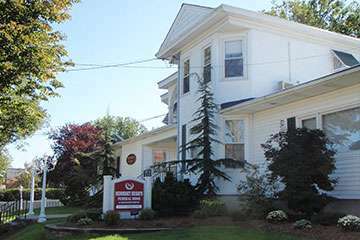 Since the Spring of 2008, when we closed the doors of our former location in Little Ferry, NJ, we have transitioned to serving those in need of our help from not only Little Ferry, but also Moonachie, South Hackensack, Hasbrouck Heights and Ridgefield Park, all from our one, central location, allowing us to give our full attention to each family's individual needs. We have been proudly serving the Bergen County area since 1941. The prices below are based on the General Price List for Trinka-Faustini Funeral Service. However, funeral homes sometimes have special pricing packages available, and you should ask if those are available. Please let the funeral director know that you found Trinka-Faustini Funeral Service on Parting.com to allow us to continue helping families like yours. The General Price List we have on file for Trinka-Faustini Funeral Service has an effective date of Feb. 7, 2016. The prices on our site are for your reference only. We can’t guarantee that the actual prices will be the same as the prices listed on our site. All funeral homes have an effective date on their Price Lists that are subject to change and we recommend that you ask the funeral home for its most recent prices over the phone or for a copy of their General Price List. The funeral directors at Trinka-Faustini Funeral Service are available to provide you with expert advice.